Catalogue of Organisms: What is Inula verbascifolia? By recommendation of the Committee for Spermatophyta (Brummitt 2005), this is. Photograph by L.R. Inula verbascifolia is a herbaceous, composite-flowered plant from the eastern Mediterranean. It is mostly found in the Balkan region, but it also reaches into south-eastern Italy and Anatolia. It is closely related to another Greek species, I. candida, and the two have been treated as a single species, but they can be distinguished by features of the leaves (Tan et al. 2003). The reason for my question, though, is that Inula verbascifolia has been the subject of an application to have its name conserved (Tan et al. 2003). The rules for naming organisms are often assumed to be complicated, and to a certain extent they are, but the underlying principles can be summed up into two rules: (1) every species should have one name that is different from all other species, and (2) when two names are in conflict, the older name is the correct one. However, like all rules of life, sometimes the best thing to do is not follow the rules. Maybe using the older name would be too confusing, if the newer name is much the better known. To account for such scenarios, all of the various bodies governing the naming of organisms (there are separate bodies for animals, plants and bacteria) make allowances for researchers on the organisms concerned to apply for the rules to be temporarily set aside in some way. In the case of Inula verbascifolia, the plant currently known by that name was not the first to be called that. The German botanist Heinrich Haussknecht recognised the Balkan species as Inula verbascifolia in 1895. Prior to that, it gone under the name of Conyza verbascifolia, coined by Carl von Willdenow in 1803. However, in 1813 Jean Poiret of France had used the name I. verbascifolia for a plant growing the gardens of the Jardin des Plantes in Paris that had originally come from the Caucasus. 1813 beats 1895, so under strict application of the rules the name Inula verbascifolia should apply to the Caucasian plant, not the Balkan one. But the Caucasian plant had not been known by this name since 1819, whereas the Balkan plant was well-known by that moniker, so Tan et al. (2003) applied for the Balkan plant to be allowed to keep it. I should point out that I'm an animal taxonomist by training, so I have only a basic awareness of the rules that apply to naming plants. One thing that interests me in this case is that things would have played out differently had the organisms in question been animals. The Zoological Code differs from the Botanical Code in that it doesn't regard the genus name as an integral part of the species name, so even if a species name is moved between genera, it still takes its priority from when it was first coined. In this case, for the Zoological Code the important date would not be 1895 when Haussknecht transferred verbascifolia to Inula, but 1803 when Willdenow called it verbascifolia in the first place. So under the Zoological Code, Willdenow's verbascifolia would be older than Poiret's verbascifolia, and there would be no need for the former to be specially upheld. Another difference between the Zoological and Botanical Codes is in the process of deciding on applications. In the Zoological Code, an appointed body of taxonomists (the Commission) directly makes each decision themselves. In the Botanical Code, on the other hand, each application goes to a Committee (there are separate committees for seed plants, algae, fungi, etc.) who then vote on a recommendation whether or not to accept the application. The final decision is not made by the Committee, but is voted on by the attendees of the next International Botanical Congress, a conference that anyone is allowed to attend (if they're willing to pay the attendance fee, of course). In the case of Inula verbascifolia, the Committee on Spermatophyta recommended that the application be accepted (Brummitt 2005), but I don't know if it has been finally voted upon. I also don't know if Congress votes often go against Committee recommendations (I wouldn't expect them to, but passions can run high in the world of taxonomy). Tan et al. 's application had to save more than just the species name. Haussknecht's Inula verbascifolia shows enough variation over its range that it has been divided between five subspecies. 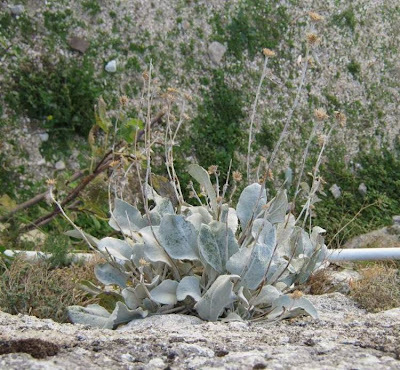 The photograph at the top of this post, taken in Italy, shows the type subspecies I. verbascifolia ssp. verbascifolia. The photograph just above shows another subspecies from Greece. But when Tan et al. looked at the original specimens examined by Willdenow, they found that they did not belong to the subspecies that had since come to be known as the type. Therefore, they designated a new type specimen belonging to the recognised type subspecies: otherwise ssp. methanea might have had to be called ssp. verbascifolia, and ssp. verbascifolia would have had to be called something else. 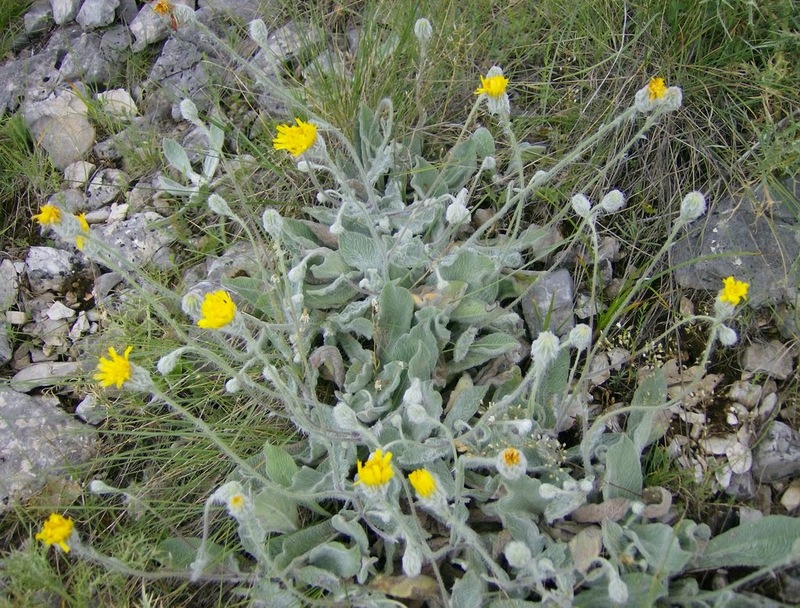 It is possible that Willdenow had himself seen a specimen of the type subspecies that has since been lost: according to Tan et al., he gave the distribution of Conyza verbascifolia as Sicily, Greece and Armenia. Tan et al. pointed out that Inula verbascifolia's distribution in Italy is in Gargano, not Sicily, so regarded Willdenow's record as an error. What they had evidently overlooked was that, in 1803, Gargano was still part of the Kingdom of Sicily. Brummitt, R. K. 2005. Report of the Committee for Spermatophyta: 56. Taxon 54 (2): 527-536. Tan, K., J. Suda & T. Raus. 2003. (1582) Proposal to conserve the name Inula verbascifolia (Willd.) Hausskn. against I. verbascifolia Poir. (Asteraceae) and with a conserved type. Taxon 52: 358-359. In the 2nd photo it's a Hieracium pannosum not an Inula verbascifolia. Does A High Population Guard Against Extinction?